YOU can learn to use ART making to tap into your beautiful note and connect with the PEACE in the core of your being – even in the midst of chaos. What’s the aim of this course? It’s about giving you tools to step into your FULL creative potential. 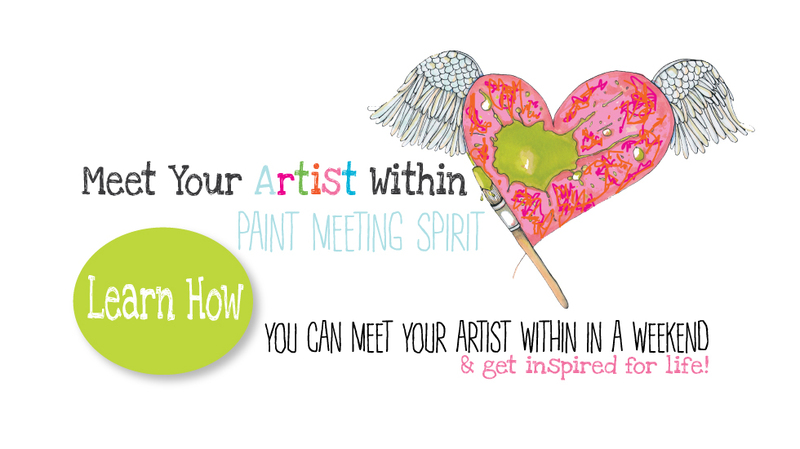 The course content acts like a divining rod to find your ARTIST within. Instead of asking how you make a living with art – you should ask – HOW do you make a life without ART? Join us in this safe and beautiful environment as we explore fun right brain exercises and meditative art practices to open up your creative spark. Then – you create your own inspirational painting. Don’t worry – no painting experience necessary. That fearfulness you may feel is normal. It’s your soul’s way of letting you know – something exciting is just around the corner for you. Whether you feel you’ve misplaced your artistic inspiration long ago or you are creative on a daily basis – you will find new ways to tap into your creativity and – your capacity for joy. Finding your own CREATIVE VOICE helps you vibrate with the joyful energy that IS your birthright. You use the same creative “muscles” anytime you have to adapt to – or CREATE CHANGE in any part of your life. Once you make creative joy a daily part of your life – you become centered, knowing and grounded in what the right choice for you will be. I believe pure art is not about judgment or who is technically proficient. It’s about YOUR own beautiful note – and I know we all would love to hear you sing it! Since the beginning of time humans have used art as a means of expressing what was going on in their tribe, in their family and in their heart. Art making was a way of expressing what’s inside – of singing their unique note. COME SING YOURS!